A colour photograph showing the Whitby Brass Band proceeding south on Brock Street past Mary Street during a parade in Whitby. The Band Master in this photograph is Stan Redfearn. He was the Band Master from 1966 to 1967. Efforts to put together a Whitby Brass Band were started in 1863 and attempts were made to secure public funding. In June 1863, town council decided that it was not advisable "to appropriate any money for the purpose of organizing a band in this town." (Whitby Chronicle, June 4, 1863). This did not deter the band members. In August they openly solicited funds from townspeople and on October 27 of the following year the Whitby Brass Band was advertising for business in the Whitby Chronicle. On May 31, 1866, an article in the Whitby Chronicle claims that the band was officially recognized for its contribution to the community. During the First World War, the band became associated with the 34th Regiment. By 1915, the band had dropped out of sight. By the 1920s, the band had regrouped and was now known as the "Whitby Citizens' Band". The band continues to operate to this day in Whitby. (Information for this entry was found in "Brass Roots: Whitby Brass Band Then and Now" by Jacky Bramma (2002). 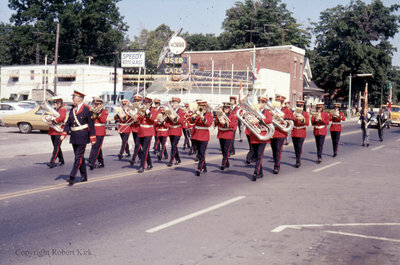 Parade, c.1967, Robert Kirk. Whitby Archives D2013_011_010.